Hyundai i40 to go upmarket | What Car? The new Hyundai i40 will spearhead a campaign by the car maker to win customers on the strength of its designs rather than merely because its cars are inexpensive. The i40 estate will go on sale at the beginning of September, and ushers in a rebranding of Hyundai as it pushes upmarket. 'The exterior and interior designs of the i40 have had some very good reviews in our customer clinics,' said Allan Rushforth, chief operating officer and senior vice president of Hyundai Motor Europe. 'The reaction to the car has been extremely positive. The i40 saloon will be unveiled at the Barcelona motor show in May before going on sale in November. Although final specifications have yet to be confirmed, all i40s will be sold with plenty of standard equipment. Upmarket options will include heated rear seats, reclining rear seats and a lane departure-warning system. 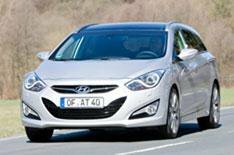 Hyundai will also push fleet sales with the i40, and is looking to split sales 50-50 with the private market. Rushforth said that sales to hire car companies would be limited, however, to protect resale values. 'We'll put some out there so potential customers can experience the cars, but it will be a small number,' he said. Hyundai also expects its five-year, unlimited-mileage warranty to help boost fleet sales.